Johnny is the author of several books including Preserved (Kyle Cathie, 2005) (‘Elegantly written’ – Mail on Sunday) and The Man Who Touched the Sky (Hodder 2002) (‘A fascinating and exhilarating read’ – Sir Richard Branson). He co-authored The Football Book (Dorling Kindersley, 2009) with David Goldblatt. In 2012 he and David published How To Watch the Olympics (UK: Profile; US : Riverhead), which was an Observer, Independent and Independent on Sunday sports book of the year. 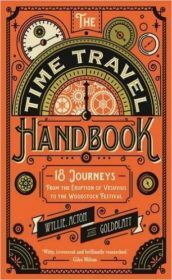 In 2015 they published The Time Travel Handbook: From the Eruption of Vesuvius to the Woodstock Festival (UK: Profile; US: Harper Design).